The ABC1 atypical kinases (aPKs) have been extensively studied in bacteria, yeast and human, where their mutation causes a deficiency of ubiquinone, an isoprenoid compound in the respiratory electron transfer chain. Considerably less is known, however, about their evolution and function in higher plants. In this study, we identified 16 ABC1-domain containing genes from model plant rice by comprehensive genome analysis and gene cloning. Detection of positive selection showed that purifying selection was the major force underlying the evolution of most rice and Arabidopsis ABC1s. However, the expression profiles of plant ABC1s appear to have diverged based on microarray data analysis and realtime PCR; some of them are primarily expressed in developing leaves, some in stamens and/or mature pollen, whereas others in diverse tissues and organs. The possible functions of plant ABC1s were identified using genome-wide coexpression analysis. 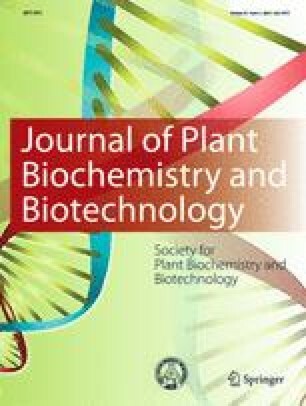 This analysis suggested that many of them might be involved in the regulation of isoprenoid biosynthesis. In conclusion, the plant ABC1 aPKs, which harbor distinct expression patterns, might have conserved functions in modulating isoprenoid metabolism. Qingsong Gao and Hui Zang contributed equally to this work. The online version of this article (doi: 10.1007/s13562-014-0259-5) contains supplementary material, which is available to authorized users. This work was supported by grants from the Ministry of Agriculture of China for Transgenic Research (2013ZX08009003-001-006), the National Natural Science Foundation of China (30900871), the Jiangsu Agriculture Science and Technology Innovation Fund (CX(11)4058), the Natural Science Foundation (BK2011409) and the Key Science and Technology Support Program (BE2012309) of Jiangsu Province, the Opening Projects of Key Laboratory of Plant Functional Genomics of Jiangsu Province (K11006) and Jiangsu Key Laboratory for Eco-Agricultural Biotechnology around Hongze Lake (HZL1112), and the “Qinglan” Project.